It’s a good thing that I live on the coast and have access to an abundance of fresh seafood because I absolutely looooove it! 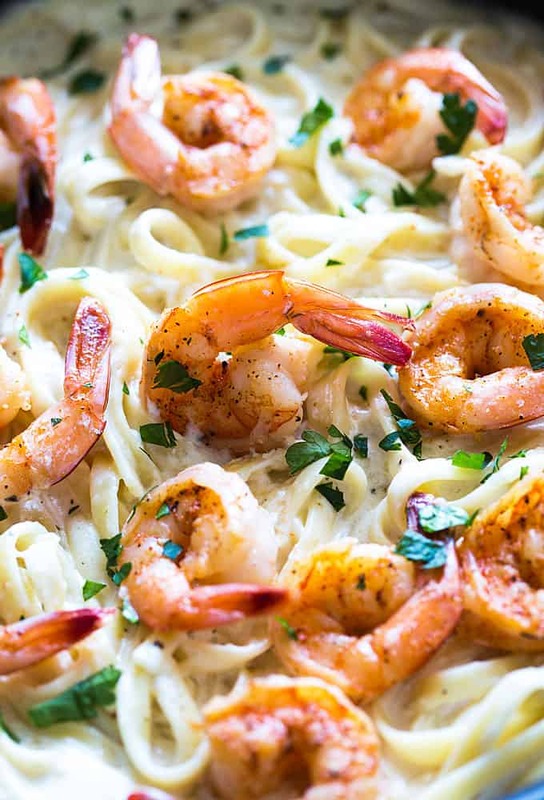 Today I’m sharing an easy recipe for Cajun Shrimp Alfredo. 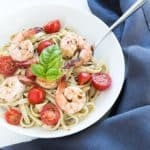 Not only is this amazingly delicious, but if your shrimp are already peeled and you have your pasta going while you’re working with the shrimp and alfredo sauce, this comes together in just 20 minutes. Yes, I said 20 minutes! 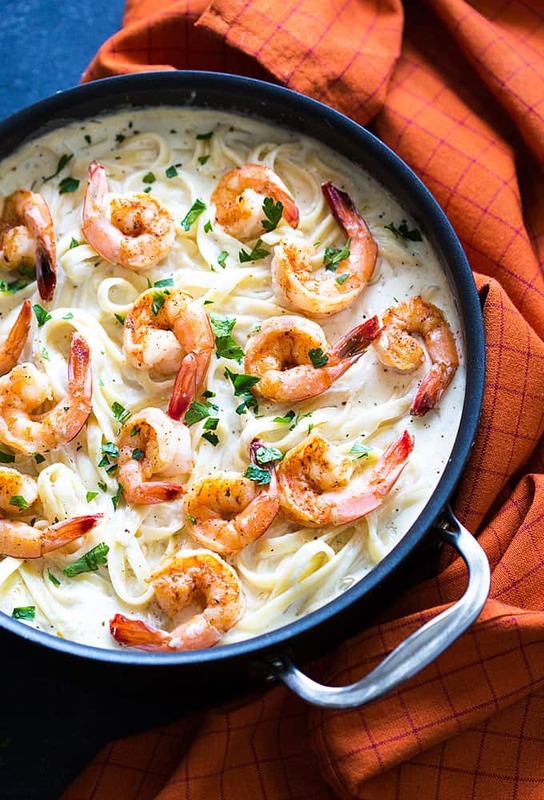 Just look at those beautiful, perfectly seasoned shrimp floating around in all of that creamy, cheesy pasta goodness! 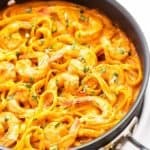 This dish is perfect ANY night of the week and special occasions (no one will ever guess it comes together so quickly and easily!). 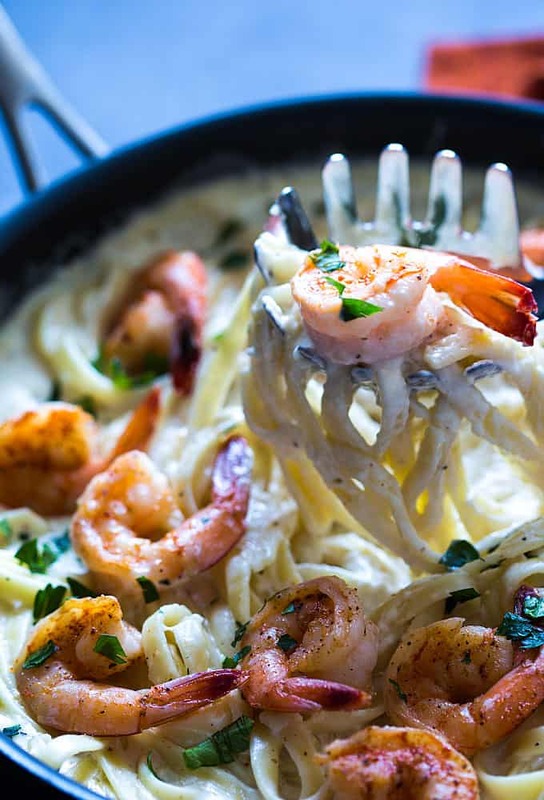 The shrimp only take a few minutes to cook in a large skillet… remove the shrimp when they’re done and make the easy alfredo sauce right in the same skillet. 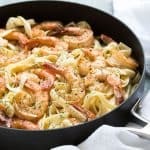 Add the cooked pasta and shrimp to the sauce in the skillet and BAM! Dinner in a flash. ENJOY! 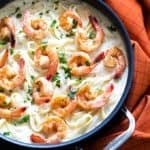 Cajun shrimp in a bed of creamy, cheesy alfredo sauce. Just 20 minutes is all it takes! Begin cooking the pasta. While pasta is cooking, season shrimp with cajun seasoning, salt and pepper. 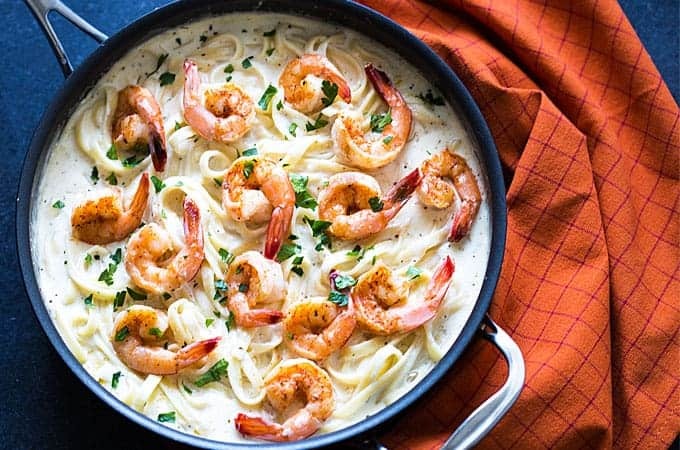 Melt the 2 tablespoons of butter for the shrimp in a large skillet over medium heat. 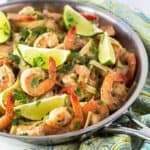 Add shrimp to the skillet and cook for 3-4 minutes (stirring often), or until shrimp have just turned pink on both sides. Cook shrimp in 2 batches if necessary. Transfer shrimp to a plate and set aside. In the same skillet over medium heat, melt the 1/2 cup of unsalted butter. Add garlic and saute (stirring constantly), until fragrant, about 30 seconds. Add cream cheese cubes and Italian seasoning. Stir with a whisk to smooth out any large lumps. Slowly pour in milk, about 1/4 cup at a time, while continuing to whisk. Add Parmesan cheese and pepper. Stir well to combine. Continue to cook and stir for 2-3 minutes, or until sauce reaches desired thickness. Remove from heat and add pasta to skillet with sauce. Toss to coat evenly and top with shrimp. Garnish with parsley, if desired and serve immediately. The parmesan chz used in the recipe is the one where the cheese is already grated or the one in the green container. I used both it was amazing! Thanks for the inspiration! 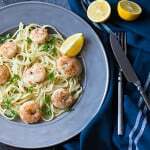 I made the Cajun Alfredo pasta 2 days ago and it was so well received that I made it again today it us delicious and does not take long time to prepare. Thanks so much, Theresa… so glad everyone enjoyed it! Can u use regular parmesan cheese in a jar? Hi Janine, Yes that’s what I used. The grated Parmesan cheese that typically comes in a plastic jar with a green top. Hope you enjoy! 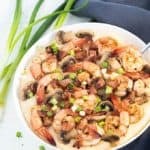 Can I add mushrooms and rotel or tomatoes or is it spicy enough? Wonderful recipe! My family loved it!! Great dish!! I added onions and sun dried tomatoes. Loved it!! Purchased a bag of frozen shrimp with no idea what do with them. Great change from beef & chicken. Made enough for two meals just the way you suggested! Can the sauce be de ahead of time? My family loved this recipe. Simple ingredients, and easy to prepare! I know spice being from Louisiana!! I give this recipe a thumbs up!! !